1/2 loaf, day old French Bread, sliced and baked in a 300 degree oven until crispy, but not browned. Ground in a food Processor to make bread crumbs. Cut the Mirlitons in half lengthwise, remove the seeds. Bring a large pot of water to a boil, season with salt as you would pasta water. Add a few Bay leaves and a bundle of fresh Thyme. When the water comes to a boil add the mirliton halves, and simmer for 45 minutes, or until tender. Cool. When the mirlitons are cool scoop out most of the pulp, leaving a shell about 1/2 inch thick. Dry the shells by patting with a paper towel. Reserve 1/2 of the the pulp and drain on paper towels, as they hold a lot of water. When dry, chop. In a large cast iron skillet melt the unsalted butter over medium heat, when hot add the andouille. Cook stirring often until slightly browned. Add the onion, celery and bell pepper and the creole seasoning, cook for 8- 10 minutes stirring often until the onions start to carmelize and the vegetables are soft. Add the garlic, Mirliton flesh and Thyme, cook for 2 minutes more. Add the shrimp and green onions and cook until the shrimp turn pink. Add 1/2 Cup water (or Shrimp Stock if you have any on hand) and 1 Cup of the bread crumbs. Stir until the mixture comes together. More bread crumbs or water may be needed. The mixture should be thick, yet moist, and it should hold together. Season to taste with salt, pepper and cayenne. Divide the stuffing amongst the 4 mirliton shells and cover with the topping. Place into a 350 degrees oven until hot and the topping is golden brown. Serve immediately. 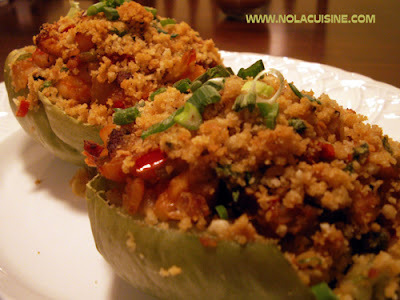 Be sure and visit my ever growing Index of Creole & Cajun Recipes which features all of the recipes on this site. Great recipe, Danno !!! You got the seasoning just RIGHT and the addition of Tasso is surely something every Cajun will appreciate. Mirlitons are a very very unused vegetable. oh wow! this looks and sounds fabulous! i only use chayote in soups and this recipe sounds wonderful! i can’t wait to try it! Excellent! I added crawfish tails and green onion sauage. My family loved it. Thanks. The text of your stuffed mirleton recipe says to add creole seasoning. There is no ‘creole seasoning” mentioned in the list of ingredients, just kosher salt, black pepper and cayenne. Please enlighten me.